Tom, you mentioned "clear coat" and not “gel coat,” and it’s important to know the difference. 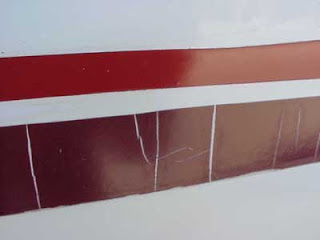 Coaches built in the early 1990's may have an applied clear coat or it may be simply gel-coated fiberglass. It’s apparent yours probably received a dealer-applied coating sold and installed at the time of the original purchase. These coatings were popular back then, and costly, but only lasted about five years under normal use. As you’ve noticed, they tend to deteriorate and become unsightly over time. Removal is difficult but can be accomplished with the proper knowledge and a little patience. To remove the remaining coating you can use any cleaning product that contains ammonia, including 409 or any glass cleaner that contains ammonia D. It will be necessary to allow the cleaner to “soak” into the clear coat before wiping clean. Removing the cracked decals is also accomplished with the right tools and a good deal of time and patience. You will need a heat gun, not a simple hair dryer, but a commercial-type heat gun. You’ll also need a plastic scraper. Scrapers and heat guns are available at any of the big box home-care stores. Be sure the scraper is yellow or white plastic. They are less prone to damaging the exterior surface. Remember, heat guns can get very hot so be careful to not burn or blister the fiberglass while heating the decals. Gently heat the surface of the decal and push the scraper under a loosened edge. Keep warming the surface and continuing to scrape the decal. The operative words here are; slow and steady. 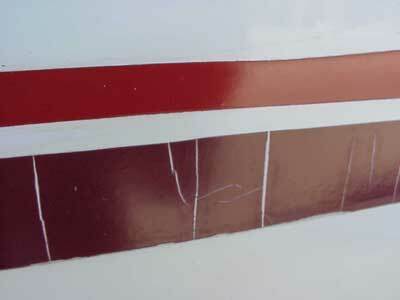 Once the decals are totally scraped away, apply an adhesive removal product to eliminate any residue left behind. Adhesive removers will either be oil based, like mineral spirits, or D-limonene based like Goo Gone. You can try both to see which works best. After the residue has been removed, I recommend an application of Protect All’s Fiberglass Oxidation Remover over the entire fiberglass surface. Depending on how oxidized your finish is, it may take two applications. Once all the oxidation has been removed, the motorhome can be prepped for painting. Since paint types are so subjective, I’ll leave it to you to do your homework to determine what is best for your situation. 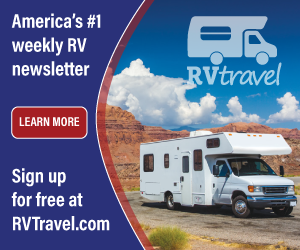 My suggestion would be to check with a local RV collision repair facility or a paint and auto body supply center in your area for the specifics. In any case, the facility must have a paint booth large enough to accommodate your coach. That will be one determining factor. But at least you can perform most of the prep work yourself. For some good reading on the care of fiberglass, check out the info published here.